Cottagers Inc. was founded in 1956 as a society for African American women who owned homes on the Vineyard. For the past 60 years, women of the Cottagers Inc., a prestigious, philanthropic group of 100 African American women who are Island homeowners, have answered the question, what does it mean to serve community? 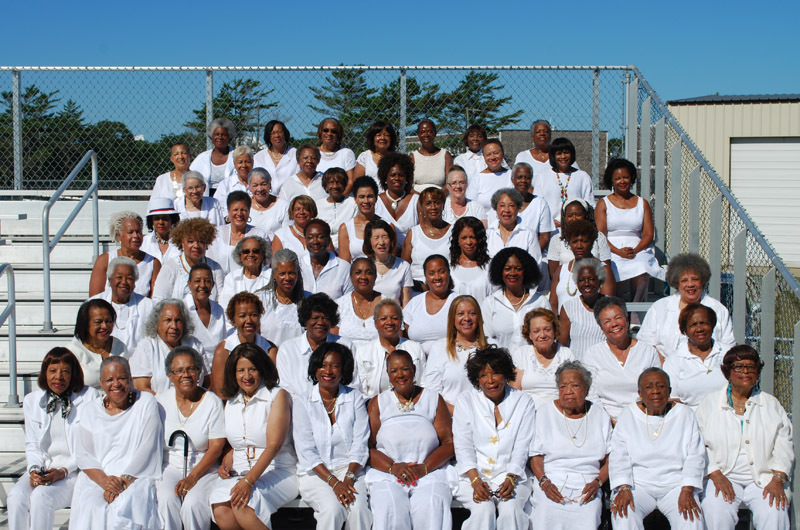 Founded in 1956 by Thelma Garland Smith, in the spirit of service and friendship, they have answered the question by giving unselfishly and empowering others to serve. According to Cottager historian and Hunter College history professor Joanne Edey-Rhodes, whose daughters Nia Rhodes Jackson and Asha Rhodes-Meade are both third-generation Cottagers: “In the mid-1950s, there were probably no more than 30 black families that vacationed in Oak Bluffs. The founders of the Cottagers came from Boston, New York, Illinois, Ohio and Washington, D.C.” At the time the Island was a relaxing sanctuary to absorb all that friendship offered. Ms. Smith spearheaded the founding of the organization with friends in response to a criticism overheard by a white Islander that blacks did not clean up the beach and did not contribute to community needs. Rather than take this as an insult, she and her friends took it as a call to action. Garbage cans were purchased for the beach. Porch coffees began planning sessions. At once such coffee, a suggestion was made that they each make a donation of $10 to the Martha’s Vineyard Hospital as a token of their appreciation and in response to the criticism. A total of $300 was collected and presented to the hospital in the name of The Cottagers. Twelve women became the founders of the organization and began recruiting others. Meeting regularly in each other’s homes, they made personal contributions, held bazaars in Hartford Park, ham and bean suppers, dinner dances, and clam bakes to raise money. Their children helped, selling grab bags. Later, as more blacks began summering on the Island, the women outgrew meeting at homes and in 1968, under the leadership of president Maggie Alston, voted to buy the old town hall on Pequot avenue along with three lots on Wamsutta avenue. The building was named Cottagers’ Corner and the group incorporated on May 28, 1969. Now they had a place of their own to meet the growing needs of black youth in the community who had few recreational options. The mortgage was burned in 1977, and the Wamsutta properties were sold to the town for the Oak Bluffs senior center. Membership in the Cottagers was capped at 100 women. Millie Henderson and Ruth Bonaparte are our oldest members, having joined in 1967. I recently took a walk back in time with Cottager Carla Tabourne, retired University of Minnesota professor of recreation therapy and gerontology who celebrates her 65th year on the Island. She recalled those early days as the child of Ruby Sayer Tabourne, a Cottager founder. “The women met on our porch. I recall watching my mother decorate a paper plate hat with fancy ribbons for one of the first Cottager, luncheon-fashion shows. I will never forget it,” she mused. After her mother’s death in 1982, she honored her legacy and accepted Cottager membership. She invited me inside her cottage at 3 Summerfield Park to show the original front of the house, now enclosed, but as it looked when the founders met on their porch, prior to its removal. The Gothic front doors and windows were an awe-inspiring trip back in time. We went on a tour of the East Chop/Highlands to see the restored home of founder Thelma Garland Smith on Dorothy West avenue and Wilhelmina Newton Smith’s cottage, carefully restored by her daughter, Cottager Joyce Newton Graves. The famous novelist of the Harlem Renaissance, Dorothy West, was a member of the Cottagers. Today, there are 98 active Cottagers. They could be only savoring beach days, but these are women who vacation with a purpose. They are among our 21st century leading ladies who frequent Wall Street, boardrooms, operating rooms, courtrooms and classrooms. They are professional women, who unlike early members that came from the East Coast, are bi-coastal coming from California, Arizona, and Florida. Four fundraisers are planned this year to mark the 60th anniversary. The 33rd annual house tour took place in July. The 44th annual fashion show is on August 3. The annual clambake will be on August 16 from 5 to 8:30 p.m. at the Sailing Camp, and the annual Black and Bling dance party is planned for August 19 from 9 p.m. to 1 a.m. at the Portuguese American Club. The organization was placed on the African American Heritage Trail on its 50th anniversary in 2006. Cottagers were honored by an exhibit at the Martha’s Vineyard Museum this summer which will close in mid-August. On August 10, the Islandwide Community Outreach Program will be held at the Tabernacle from 5 to 8 p.m. in partnership with the Martha’s Vineyard Camp Meeting Association. AARP chief executive officer JoAnn C. Jenkins, leader of the nation’s largest nonprofit, will speak on the topic and her book, Disrupting Aging. Cousen Rose Gallery will host a book signing and sell autographed books prior to and at the conclusion of the program. Meanwhile, on this 60th anniversary, president Olivia Baxter, proud of the legacy, will continue to lead the Cottagers in common spirit and common endeavor. Bettye Foster Baker lives in Oak Bluffs and Gettysburg, Pa. She has been a Cottager since 1998 and is a past president of the organization. Amazing group of ladies who are all role models. Keep the history going! This article was enlightening, refreshing and timely! The Cottagers remain relevant and true to the founders' spirits. What a blessing that the original criticism became a challenge. Congratulations and thank you for your service. You all look amazing! Well-written my friend. I and both my sister in laws are "Cottagers"and with three daughters I remain hopeful that my family involvement in this historic vineyard women's service organization will continue!This along with the "Polar Bears",the Obama visits,is why the Vineyard is such a iconic place for black people. The legacy of their work is inspirational and worthy of celebration. Congratulations, and thank you for your time, talent and treasure! The 60th Anniversary Celebration and Fashion Show introduced me to The Cottagers. What a fabulous group of women! Thanks so much for giving me an opportunity to learn more about your history and community involvement. Special thanks to my hostess Ardelia Stewart, friend Olivia Baxter, and article writer, and friend Bettye Baker. The fashion show was high energy with beautiful apparel. I would love attend again. Congratulations on 60 years of Black Girl Magic! Such perfect timing to learn about an AMAZINGLY group of African American women! My husband and I are heading your way this week, and we look forward to seeing some of the homes, island contributions and participating in the Community Outreach Program. What a wonderful article! The Cottagers are an elite group of women, who found the essence of life--giving back and inspiring those around them. Kudos ladies! I would love the opportunity to work with you all. Blessings and truly thank you for serving the community. What a beautiful article! Thank you to the cottagers for your service and legacy. The Cottagers’ 35th Annual House Tour takes place on Thursday, July 19 from 10 a.m. to 3 p.m.